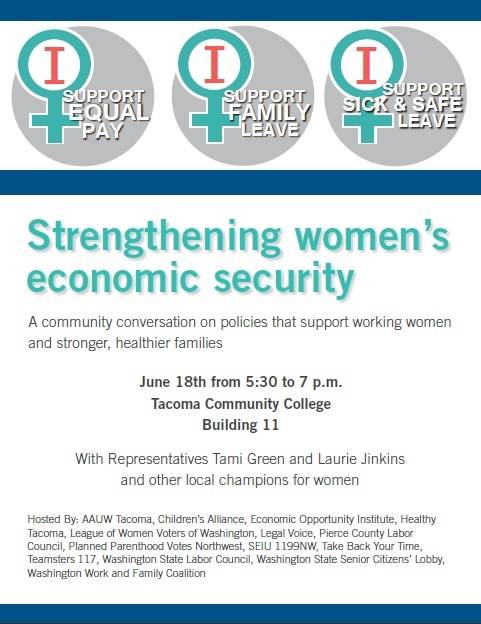 Women’s Economic Security forum Tacoma Community College, June 18, 5:30-7:00pm. Join a community conversation on policies like fair pay, paid sick days, and family leave, with Tami Green, Laurie Jinkins, and other local champions for women. Hosted By: AAUW Tacoma, Children’s Alliance, Economic Opportunity Institute, , League of Women Voters of Washington, Legal Voice, Pierce County , Planned Parenthood Votes Northwest, SEIU 1199NW, Take Back Your Time,Teamsters 117, Washington State Labor Council, Washington State Senior Citizens’ Lobby,Washington Work and Family Coalition.